This tidy town is one of Brazil's most appealing ports. There are numerous beaches to choose from, all of them picturesque and pristine. City tours include the Pernambuco Culture Center, where handmade goods are sold out of the cells of a prison-turned-crafts-market, and Republic Square to see the Teatro Santa Isabel, the Palace of the Governors and the iron bridges that span the Capibaribe River. 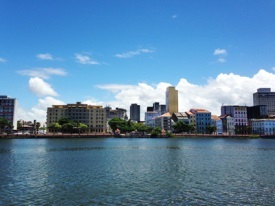 Praça Comunidade Luso Brasileira no 70 is located approximately a half hour from the Recife International Airport. Follow Avenue Barao de Sousa up to Avenue Boa Viagem. Follow the traffic up to downtown, pass pier Jose Estelita, after Forte do Brun, turn right (main entrance).